The Stairway to Heaven Bracelet is a wonderful bracelet to make and wear. It comes in many color combinations. 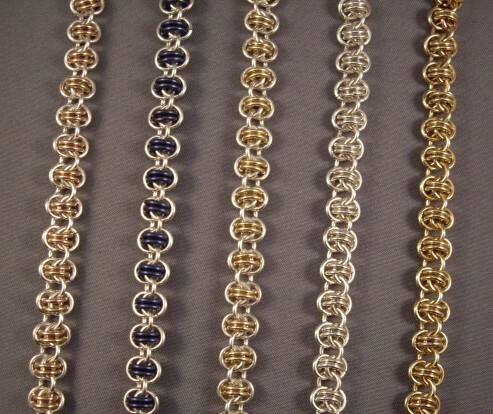 In the picture, the bracelets from left to right are: sterling silver with rose gold filled, sterling silver with blue niobium, sterling silver with yellow gold filled, sterling silver and yellow gold filled. Rose gold filled is also available. This is an intermediate weave. The clasp is not included in the kit.